The following will be the dates that are to be observed as the Holy Days in the Gregorian calendar year 2016. The bible dictates that we keep these days in their season upon their days. Therefore, we should govern ourselves accordingly by ensuring that we make arrangements with our employers to have the days marked as Sabbaths off as commanded by the Laws of YHWH (Leviticus Ch: 23). The Holy Days will begin at evening (after sundown) on the dates listed and continue through the next day and end at evening. Again, for Holy Days which are Sabbaths that begin at sundown, we need to take the next day off from work. Tags: Day of Atonement, elder Yachov ben israel, Feast of First Fruits, Feast of Tabernacles, Feast of Trumpet, Feast of Trumpets, Feast of Unleavened Bread, feast of weeks, First Fruits, Halleluyah, Hebrew Israelite, Hebrew New Year, NCCI, New Year, Passover, Pentecost, Tabernacles, Yahshua, Yahweh, YHWH | Permalink. American Thanksgiving offers an excellent present day example of Satan’s desire to imitate and attempt to be just like the Most High God. The pagan festival of Thanksgiving, honoring a host of pagan deities, takes place one month, later in November, after the biblical appointed feast of the Feast of Tabernacles! Tags: elder Yachov ben israel, Hebrew Israelite, holidays, NCCI, pagan holidays, Tabernacles, Thanksgiving, Yahshua, Yahweh, YHWH | Permalink. Who does Thanksgiving, actually THANK?! The Harvest goddesses! That’s who! All of these pagan goddesses are just figments of man’s imagination, MYTHOLOGY. 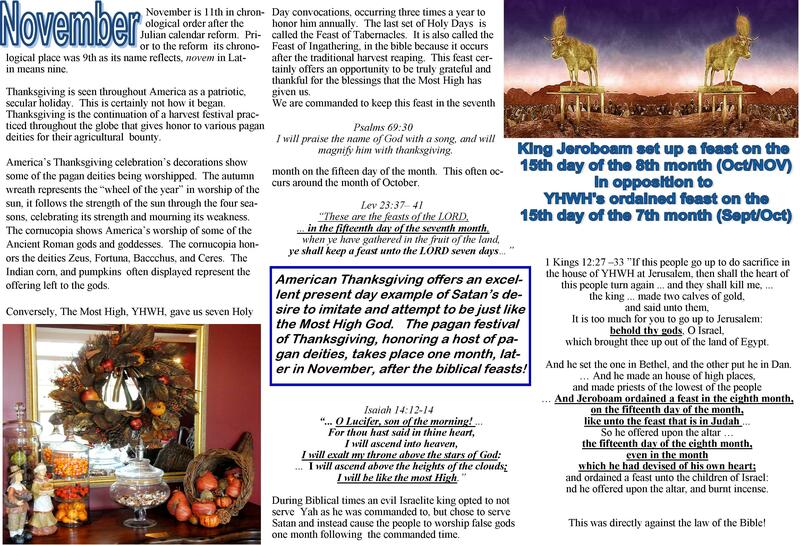 Tags: ancient Roman History, elder Yachov ben israel, Halloween, Hebrew Israelite, NCCI, pagan holidays, paganism, Thanksgiving, Yahshua, Yahweh, YHWH | Permalink.